Actress Eve Plumb, known to many as Jan Brady from her role in the 1970s TV sitcom The Brady Bunch, now spends much of her time painting. According to her website, Eve Plumb has been painting steadily for the last 20 years. She focuses on still life for her subject matter, painting objects or moments from her everyday life and travels. About her artwork she says: "I decided to focus on small intimate moments from my own life. I started noticing when sunlight hit items in the house in an interesting way and photographing them." Artwork by Eve Plumb will be on exhibit at GINA Gallery of International Naïve Art in Manhattan, New York City. 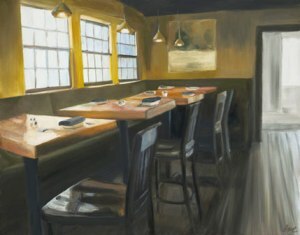 The exhibit titled Bistro: New Works by Eve Plumb, will be on display from February 14 to February 28, 2010. There will be a reception with the artist on Thursday, February 18, 2009 from 6 - 8 pm. Contact the gallery for details.